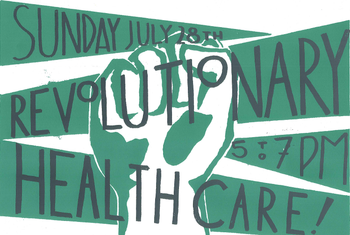 Join Chicago Women's Health Center's annual board fundraiser, Revolutionary Health Care, to celebrate yet another successful year of radical health care services. The event is an evening of networking, philanthropy, and local fare at Revolution Brewing. Tickets include two hours of UNLIMITED Rev Brews, appetizers, live music, fantastic raffles, and an arm wrestling contest! Revolutionary Healthcare will include live performances by The Howl. Chicago Women's Health Center is a unique collective working together to provide affordable, compassionate, and collaborative gynecological and mental health care to women and trans people in the Chicago area. Our health care providers, counselors, and health educators share a strong commitment to the vision our founders imagined in 1975 when they formed CWHC: a world in which all people have access to comprehensive, affordable, and sensitive health care. Our services are offered on a flexible sliding fee scale and they include: Gynecology, Counseling, Outreach & Education, Alternative Insemination and Integrative Health.